Jim Rogers, the co-chairman and lead fundraiser for the Democratic National Convention host-committee, is well versed in the art of political cronyism. Rogers, the CEO of Duke Energy Corp., one of the largest utility corporations in the country, has given generously to Democratic politicians over the years. Along with his wife, Mary Anne, he has contributed more than $210,000 to Democratic candidates and committees since 2008, more than double what the couple has given to Republicans. Of that figure, more than $150,000 went to the Democratic National Committee (DNC); $19,200 went to President Obama. Rogers is co-chairing the host committee with Charlotte Mayor Anthony Foxx (D), who was elected to a second term in November 2011. Rogers and his wife both contributed $8,000 to Foxx’s campaign, the maximum allowed under state law. Rogers has also done his part to make sure that the convention has access to plenty of cash. The Charlotte Observer reported that Rogers was "quietly raising" as much as $15 million for the DNC. Additionally, in an effort to entice the DNC to Charlotte, Rogers and Duke Energy offered to open a $10 million line of credit—guaranteed by Duke shareholders—to help finance the convention. Duke spokesman Tom Williams told the Washington Free Beacon that the offer of credit was made in the hopes of strengthening Charlotte’s application. "It’s all part of our effort to showcase the city of Charlotte," Williams said. "Nothing more, nothing less." Asked if the credit line had been utilized, a host committee official replied, "not to my knowledge," adding, "In theory, we raise the $36.6 million. The line of credit is just that. We’re obligated to pay it all back." Meanwhile, organizers of the Republican National Convention in Tampa, Fla., say they don’t anticipate needing a line of credit. "There's a tremendous amount of enthusiasm and support for the 2012 Republican National Convention," said convention spokesman James Davis. "Therefore, we have no credit lines in place or plans to borrow money." Just as Rogers has helped fund Democratic politicians, they, in turn, have helped steer massive amounts of federal funding to Duke Energy. The 2009 stimulus package, for instance, was a boon for the company: Duke received federal grants totaling $230.4 million for a number of "green" energy projects including "smart grid" development and wind energy storage. According to Recovery.gov, Duke created 196.6 jobs as a result of the grants. The company also received a $350,000 grant to assist General Motors in the development of the Chevrolet Volt, the poorly selling electric vehicle that the Obama administration has recently proposed subsidizing at a rate of $10,000 per car. Rogers’ support for the president’s "green" agenda earned him a spot on the short list to become President Obama’s Energy Secretary. Though headquartered in Charlotte, Duke maintains an active presence in Washington, D.C., having spent more than $26 million lobbying the federal government on energy-related issues since 2007. In 2009, the company enlisted the services of the Podesta Group, a lobbying firm founded by John Podesta, the former president of the Center for American Progress and co-chairman of the Obama-Biden transition team, and his brother Tony Podesta. Since then, Duke Energy has paid the firm $860,000 to lobby to "support the passage of climate change and energy legislation" and "energy efficiency and clean energy solutions," according to a database maintained by the Senate Office of Public Records. 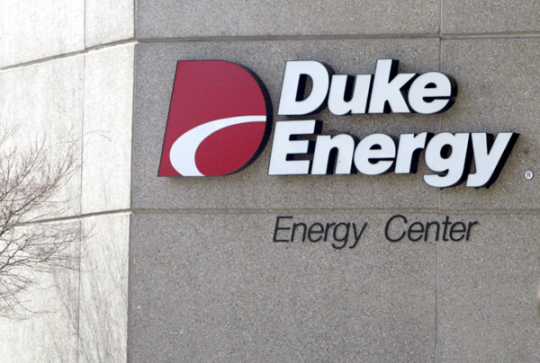 The Duke Energy Political Action Committee, which has tended to give more to Republicans in the past, reversed that trend in 2010, giving $260,000 to Democratic candidates following the passage of the stimulus, compared with just $209,000 to Republicans. The Washington Free Beacon noted last week that the convention host-committee is operating under very strict fundraising restrictions, refusing to accept money from corporations, lobbyists, or other special interest groups such as unions. However, these self-imposed restrictions did not prevent Rogers from accompanying convention CEO Steve Kerrigan, a former national political director for Sen. Ted Kennedy (D-Mass. ), to Washington, D.C. for a meeting with high-powered lobbyists. Bloomberg reported that Rogers and Kerrigan were touting an array of expensive convention "packages," including premium hotels rooms and concierge service, aimed at ultra-wealthy donors. A convention spokesperson said they were simply "educating Beltway types about the new rules." The host committee has been charged with raising $36.6 million to help cover a portion of the convention costs. Given the new restrictions, including a $100,000 limitation on individual donations, the goal will be difficult to reach. For instance, of the $61 million the DNC raised for its 2008 convention in Denver, Colo., more than 70 percent came from donations of $250,000 or higher. Nearly a quarter of the convention’s funding came from just 12 donations of more than $1 million. Union groups alone gave $8.3 million (14 percent). Contributions of $100,000 or less—this year’s limit—accounted for only 5 percent of the total. It is unclear whether the host committee is having trouble meeting its fundraising target. A committee official told the Free Beacon there were no plans to publicly release fundraising figures before the FEC-mandated deadline of one month following the convention. This entry was posted in Issues and tagged Democratic Donors, DNC, Jim Rogers. Bookmark the permalink.